Tickets only available at box office with subject to capacity. Mumbai-based artist management and entertainment company Kranti Art Theory (KAT) turns a year old this month ! 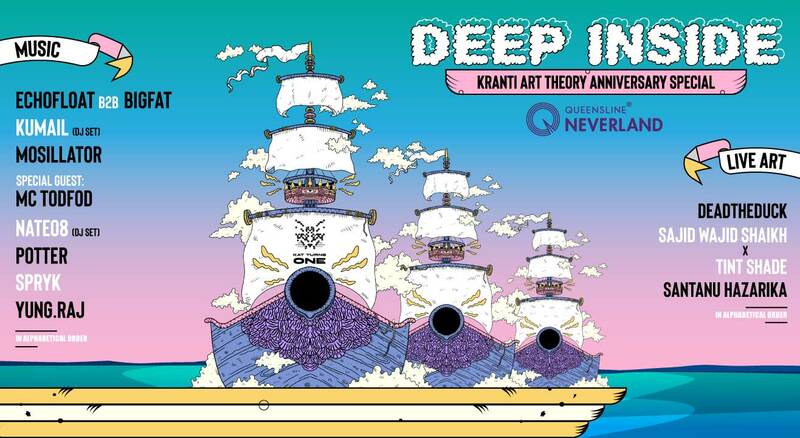 To celebrate, they’re launching a new monthly party on a ship called DEEP INSIDE, with Queensline- a floating restaurant. The party takes place on a majestic ship named Queensline Neverland. The event aims at showcasing a collaborative effort from the artistic community each bring forth their own unique style to this massive audio – visual showcase on a ship. The 7 hour line up comprises of some of the finest contemporary artists from the Indian circuit. Boarding and Departure Timings to be announced. Set Timings to be announced. EchoFloat is a project conceived by Jeff Nelson in 2011. The music he explores ranges from lush thoughtful soundscapes to intricate granular textures. Bass music has always been an underlying aspect of his sound palette. It's the foundation over which he explores his own productions and DJ sets that are reminiscent of organic and cyberpunk aesthetics in hopes to invoke a sense of space, form, interconnectivity and movement. EchoFloat's sounds are heavily inspired by artists like Telefon Tel Aviv, Nosaj Thing, Lorn, Amon Tobin, Autechre, Valance Drakes, Nonotak Studio, FIS, Rob Clouth and labels like Warp, Subtext Recordings, Outlier Recordings, Terra Null, etc. Aniruddh Mehta aka bigfat is Graphic Designer, Visual Artist and a DJ. He believes in no-hype, low end bass music. His ideal night is a dark room with a good soundsystem. He is constantly exploring the larger hemisphere of dub music ranging from roots reggae to meditative dubstep to bass music. He has previously shared the stage with Kahn, Flowdan, Delhi Sultanate, Goth-Trad, Loefah, Amit, Hrdvsion and more. He is also the host of Control Sessions, a monthly online radio show on Boxout.fm. Hoods up, heads down and eyes shut. Kumail is producer, performing artist and DJ from Mumbai, India. Over the last four years, he has ascended to the very top of India’s burgeoning culture of electronic music on two parallel paths - as a roughneck DJ notorious for breaking ankles, and as a gifted musician and bandleader drawing expansive canvases of rhythm, texture and emotion. In 2018, those paths led him to a DJ set at Dimensions Festival 2018 in Croatia and a string of several live festival dates across India in the winter. In the past, he has shared the stage with the likes of Shigeto, Four Tet, DJ Koze, Teebs, Ratatat, Mount Kimbie and Kutmah, and been featured on Boiler Room, Sofar Sounds and COLORS. The onset of this summer will herald the release of a recently finished brand-new album, and an accompanying tour unlike any he’s done before. Blending organic and electronic influences into something really special, MOSILLATOR takes bass music to the next level. Beyond steady wobbles and crazy sick bass lines, beyond hard hitting and mosh pit male energy, this is a seductive piece of work that destroys dance floors world wide. MC TodFod is a Gujarati/Hindi rapper from popular multi-lingual rap group – Swadesi. Based in Bombay, he raps about the hood mentality and about social topics. His rap Style is conscious and is trying to bring about change through his art. NATE08 is the solo project of well known bass player, musician and producer Nathan Thomas and is an exploration of his love for electronic music. He is represented by Kranti Art Theory. Being a sessions bass player in the Indian music circuit for the last 6 years, he is now experimenting with his own sounds and productions. His music comes from a bunch of influences particularly jazz, r&b and hip hop. Using samples from various genres of music and manipulating them to create groovy sonic experiences makes the foundation for his sound. He also incorporates the use of electric bass, synth bass, various effect pedals and soundscapes as part of his productions and live set. NATE08’s debut EP ‘DRMZ’ released worldwide on 4th December 2018 across all digital music platforms, and he has a new release in the making. Spryk is the brainchild of Tejas Nair, who has been consistently redefining the role of an independent electronic artist in the Indian scene across various spectrums for nearly 4 years. His tireless creative endeavours engaging with electronic music and technology-driven art has now amassed a significant following for his work. His DJ set's feature a mix of bass music, swift rhythmic beats and a plethora of halftime beats. A keen purveyor of Bass driven electronic music and various forms of New Media arts, the last year has seen his work endorsed and supported by the likes of Red Bull Music as a key artist in the region and Sennheiser Audio as a partner for their immersive audio line of products titled AMBEO. He has also worked with and been featured by the likes of Adidas Originals and PUMA on various campaigns. Raj Verma aka Yung Raj is a producer and beatboxer from Hyderabad and an artist represented by Kranti Art Theory, who has been performing at the biggest venues and festivals in the country since 2011. He has performed with both nationally and internationally acclaimed acts like Foreign Beggars, Shri, Karsh Kale, Niladri Kumar, Shiva Sound System, BOGL, Func, Stitch In Nine and was also an active member of popular acapella outfit – Voctronica until late 2017. Having moved on to focus on his solo productions, he released his debut EP ‘Laced Loops’ in July 2018 and recently a compilation 'October Heat' which was well received by the Indian music fraternity. In this project, Raj experiments with time, tempo and rhythm, blending hip-hop beats with melodic chord progressions, vocal samples and beatboxing to create a style that is unique to his live performances. Madhav Nair is a comix artist and illustrator trained at Srishti Institute of Art, Design and Technology, Bangalore and is an artist represented by Kranti Art Theory. Living and working in Mumbai, all of his work is published under the pseudonym deadtheduck. Sajid is a Multidisciplinary artist from Bombay, India and is an artist represented by Kranti Art Theory. He experiments with shape, color and line to produce bespoke illustration, pattern design, portraiture and typography. He takes inspiration from Music and Fine Art to create unique works, which fuse traditional drawing techniques with digital technology. Sajid's clientele includes Google, Facebook, PayPal, Yahoo, Adidas, Red Bull, Condé Nast to name a few. Shivangi Gupta aka Tint Shade is a Bombay based artist and writer with over 8 years of experience in advertising and marketing- related fields. Apart from conceptualizing branding and advertising campaigns for high-profile clients, Shivangi is a self taught artist and has been experimenting with a unique water marbling technique called Suminagashi since 2015 under the moniker Tint Shade. She has previously done live visuals for gigs at the Maker’s Asylum and the Hive by coupling this artistic technique with a simple projection set up and live sound. She has also conducted Suminagashi workshops at the The Hive, where participants made artworks using this technique. Apart from being unique and a lot of fun, the process itself is quite therapeutic and meditative and Shivangi looks forward to exploring the various possibilities that this art form entails by way of experimentation and collaborations, be it traditional artworks, experiences or visuals. She is currently working on launching a range of handmade products using Suminagashi as the foundation stone for all her work. Santanu Hazrika is a self-taught artist represented by Kranti Art Theory, from the valley of Assam who always had a habit of scribbling thing since his childhood. Although being a student of Mechanical Engineering, his perception of life and art is based on spirituality and nature. He finds his inspiration from every form of art, be it music, visual art, films and even emotions and human interactions. His art also finds inspiration from Hindu mythology. His field of work ranges from Illustrations , Paintings , Murals , Venue décor and graphic designing. He also made a few notable contributions to the field of Art. He is the World Champion of the first ever Redbull Doodle Art Championship in 2014 and has also be award by the Chief Minister of Assam.